1*Apple Watch genuine leather band(Watch not included). 1*stainless steel screwdriver for installing/uninstalling watch adapters. 1. We hope you enjoy the comfort, classy feel of the leather watch strap. please keep the strap dry, avoid putting it into water directly, the strap was not designed to swim with. 2. There are small grain/color difference for each strap because of natural difference. 3. 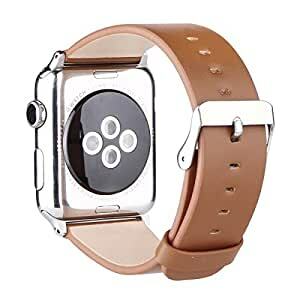 Specially designed watch connectors on both ends, the strap and watch were mechanically jointed with no screws, no more risk of falling off your wrist. 4. Please contact us if you had any suggestions, your opnion counts and we will improve to provide always better watch straps.